Scottish giants Rangers hit the ground running in the Junior section of the Dale Farm Milk Cup. The young Gers defeated Sheffield United at the Coleraine Showgrounds thanks to a solitary goal from Zak Rudden four minutes from time was enough to give Rangers a deserved victory in horrible conditions. Rudden found space at the edge of the box and found the top corner with an unstoppable finish. On the stroke of full-time, Sheffield United nearly salvaged a point as a half volley from Cameron Hawkes went narrowly wide of the far post with Lewis Muir rooted to the spot. Liverpool also got their Milk Cup campaign off to an impressive start by hitting County Tyrone for six at the Ballymena Showgrounds. Glen McCauley bagged a brace, either side of an own goal before Curtis Jones’ double and Reece McGinley completed a 6-0 rout. Elsewhere, it was a good day for the local county sides, with teams recording wins. County Down got their Milk Cup campaign off to a flying start with a remarkable 4-0 victory in Clough over Football League said Brentford. Down hammered the Bees 4-0 with Leo Brown hitting a brace. Alex McIlmail and Jack Chambers also found the back of net. Some believe Down could reach the latter stages of the tournament but manager David Bryson isn’t getting ahead of himself. “It’s a fantastic way to start their tournament. It actually took us a while to get up to the pace of the game and our goalkeeper made two super saves when we were 1-0 up. Ollie Mullan’s County Londonderry also got their campaign off to a fine start thanks to a 3-2 win over Californian side Orange County Blues at Roe Mill. 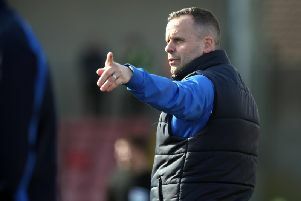 Stefan Seaton’s County Antrim reached last year’s final before losing to Corinthians. They got their 2015 campaign off to a fine start with a 3-0 win over North Dublin in Broughshane. Armagh chalked up another win for the counties. They beat Swindon Town 3-1 at Anderson Park. Fermanagh weren’t so fortunate. Sam Gamble’s boys lost 6-1 to Roma USA at Parker Avenue in Portrush.